Are you one of the lucky ones that has one of the antique baby beds that your ancestors slept in when they were small? Have you wondered if it is safe to let your baby sleep in it? Even though family heirlooms make a lovely centerpiece in a vintage nursery theme you should never compromise the safety of your child! Antique cribs are often passed down through the generations. Many pieces are French and German in origin with where craftsmen are famous for their woodworking skills. The carvings and history of these furnishings make it ever so tempting to include them as part of the baby's nursery décor but the question is whether or not antique wooden or iron baby beds be used as conversation pieces or can the baby actually sleep in one. First of all, and I think that you will agree that NOTHING is worth compromising the health and well-being of a child but that being said, some old cribs and cradles may (the emphasis on "may") be safe. It's my opinion that antique or vintage style homemade wood baby cradles in good condition don't present nearly as many possibilities for mishap as baby beds although they should thoroughly examined before using. And if you move your antique baby beds and nursery furniture on a regular basis, be aware lots of these beds are made of heavy iron.Antique baby beds don't move easily due to the weight! So, you'd better have a big, strong man to help you move this heavy piece of antique baby furniture in your antique baby room decor unless your idea of antique baby furniture is a 1970s antique baby crib with plastic bubbles on the ends. Another issue facing you with antique baby beds or cribs is that antique baby furniture hardware is difficult if not impossible to locate. You may have to find an identical antique baby crib and get replacement hardware from it. This is not going to be cheap unless you get lucky and find a really ratty crib whose only saving grace is that ONE piece of replacement hardware that you need to salvage your antique wooden crib. Cradles are outgrown before you can get the hang of installing the cradle bedding. So, the safety checklist for a cradle might be shorter than that of a bed for an older baby. It's a fact that you just don't find the intricate patterns, details and pride of craftsmanship in modern baby cribs that are common in antique baby beds. To find brass fittings and embellished iron work on any piece of nursery furniture in today's market you would have to spend a fortune to buy it! Of course you could take that antique white iron bed you found in the attic or the flea market and refinish it, but would this bed be the safest place for your baby to nap? Do not take the risk and learn too late that the beautifully detailed cutouts and curliques of a lovely antique wooden baby crib that caught your eye could be extremely dangerous for an infant. A baby born in the last century or even the one before probably made it to adulthood in complete safety after having used one of these beds. However, I believe in going down a crib and crib mattress safety checklist before declaring any baby bed suitable for use! That rule does not just apply to antique baby beds at my house either! That goes for pretty much ANY bed, antique or not, that my baby goes to sleep in. Go to one of the trusted government sites that is an authority on the latest safety standards for baby nursery furniture and make sure that your antique baby cradle or bed makes the grade in every way. 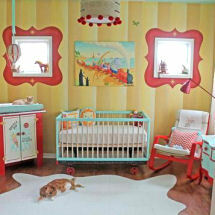 A beautiful vintage nursery theme is great, but not if your child's safety hangs in the balance. If you were not fortunate enough to have packrat ancestors that kept every stick of wooden furniture they ever owned, do not despair! Buy an antique replica for decorative purposes or baby's playtime to add to the vintage feel of your project. You can find lovely pieces of nursery furniture in antique white or rustic primitive looks with distressed finishes. Enjoy the unique vintage good looks without many of the concerns that you would have with the use of an older piece of furniture. Many imitations are constructed of solid wood and come in designs copied from antique baby beds and baby cradles. Here's a creative baby nursery decorating idea, save grandmother's priceless cradle and wicker doll baby carriage to hold your daughter's baby dolls. For more ideas on how to use antiques in your nursery design please go to our main nursery themes listing pages. There are many more articles about baby gear, nursery themes and baby decorating projects on Unique Baby Gear Ideas so don't leave until you take a look.